This post is by way of an out-of-date footnote to the previous two. I never thought I’d see the day when I would willingly come to the defence of Michael O’Leary, CEO of Ryanair, but – never say never – it’s happened! 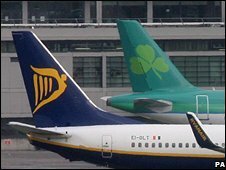 O’Leary revels in his unpopularity, a result as much of his airline’s lack of frills as of his straight-talking defence of this policy. Even though I’ve been a victim of his airline’s policies, I am more than happy to assert and defend his right to talk straight, not only in defence of those policies, but also to debate the merits of his airline taking over another. Last week, he and Dermot Mannion (the CEO of Aer Lingus, the airline in Ryanair’s sights) had been scheduled to engage in just such a debate on Prime Time, RTÉ‘s flagship current affairs tv program, but the Irish Takeover Panel considered that it would constitute a breach of take over regulations, and the debate was cancelled. Nothing daunted, O’Leary sought to quash this ‘gag order’, and commenced judicial review proceedings. However, given the failure of the takeover, the court challenge was withdrawn. This is a pity. Let us assume that the Take Over Panel acted entirely within their powers under the Irish Takeover Panel Act, 1997 (also here). If so, can such a gagging order be a proportionate restriction upon the right to freedom of expression? We won’t have a court decision on the issue this time, but – guess what? – in my view, it would be hard to defend the order.